Didcot Sixth Form (DSF) is a unique partnership between two very successful schools, Didcot Girls’ School and St Birinus School. These two schools, both part of the Ridgeway Education Trust, have a history of excellent educational collaboration. Didcot Sixth Form is a vibrant mixed sixth form utilising both the girls’ and boys’ school sites and staff expertise. The values of both schools join together to create a sixth form provision which promotes high quality learning in an inclusive learning environment based on respectful relationships. Our sixth form students play a full role in the life of the two schools as well as in the sixth form itself. We currently have over 300 students allowing us to capitalise on the economies of scale this provides. We are able to offer over 30 Advanced Level and Vocational courses, English and Mathematics GCSE (for those students without a level 4 or better), a varied enrichment programme, opportunities to develop leadership skills, the support of a tutor and high quality advice and guidance in taking the next step towards higher education, apprenticeships and employment. The progression routes of our students are excellent. We are very proud of Didcot Sixth Form. We believe that the provision we offer of a rounded, high quality education is second to none – and our results, year on year, testify to this. This summer, our A Level students achieved excellent results again with 1 in 2 of all entries graded an A*, A or B, and many of our students securing a place at a Russell Group University. Other than those taking a year out, all of our students have successfully progressed to university, college or apprenticeship courses, or moved into employment. We are confident that we will continue to realise these levels of success for current and future students in Didcot Sixth Form. If you are new to the Didcot schools, we hope you will visit and see us in action and that you will then be inspired to make an application. 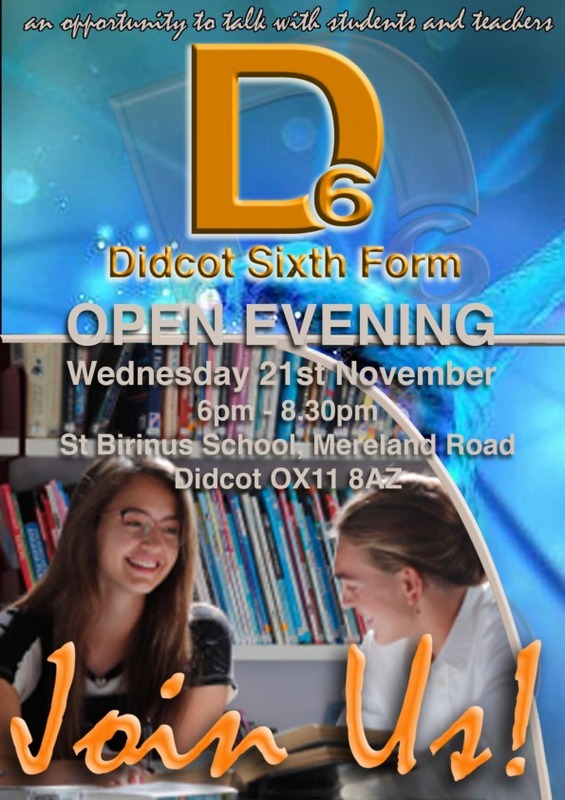 We look forward to welcoming you to Didcot Sixth Form. If you are considering DSF for your sixth form studies and would like to arrange a visit then please contact Mr Paul Willett, Director of Sixth Form at either site.